This comet, which has spent all of its time in the south until now, is currently coming out of solar conjunction and it is moving rapidly north. It should become visible in the UK sometime towards the end of November as a 6th magnitude object low in the SE at dawn. We have just issued BAA Circular No. 835 which is available for download if you are logged in to the site. There is also a news article on the Comet Section page. It was a cold and moonlit morning here in Essex, but I decided to find a darkish spot near the SE Essex marshes and image comet 2013US10 Catalina. My 200mm telephoto lens and a stack of 16 x 10 second exposures recorded the dust and gas tails. 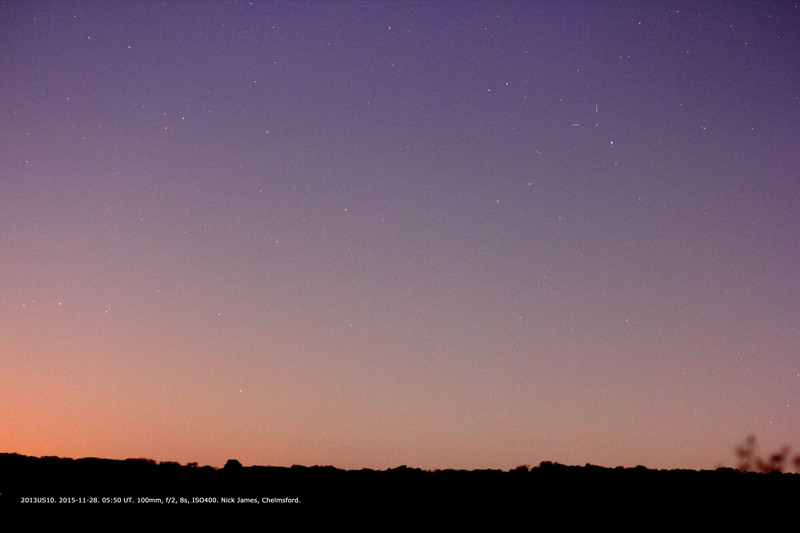 The image at 05.52hrs UT was squeezed in at the start of astronomical twilight but before the sky brightened too much. The comet was only 5 degrees above the horizon at the time of the image. When the comet moves further away from the Sun it should be a good one! Well done, Peter. A nice image, especially considering the challenging conditions you were up against. I hope you'll get more opportunities. Nice shot Peter. We were lucky with that cloud gap on Saturday morning. My single frame taken from Chelmsford is here. This is a single 8s frame with a 100mm lens but I have 30 of them to stack so hopefully should be able to detect some tail detail. In any case this comet is now definitely available from our latitudes and it should be a good one. That's a nice image Peter. You can see both tails clearly. Here is the result of stacking 28 x 8s exposures taken on Saturday morning using a 100mm, f/2 lens. The tails are just visible. I estimate a magnitude of 7.0 which seems a bit faint but the sky was very bright. As forecast the sky cleared around 2am after rain and the transparency was very good this morning at 5. The Moon is getting closer to the comet but it is now only a thick crescent so is becoming less of a problem. Since the comet is still too low for my main telescope I drove to a dark site east of Chelmsford and set up there. At around 5:30 I had set up my imaging equipment (Canon EOS550D + 200mm, f/2.8L lens on a Vixen Sphinx mount) and so started searching with 10x50 bins. The comet was definitely easier to see in the bins than my last chance a week ago but the conditions were a lot better. This image is a stack of 22 x 30s exposures from 05:41 - 05:54 not tracked on the comet. The dust trail and gas tail show up nicely.